Explanation: How do violent stars affect their surroundings? 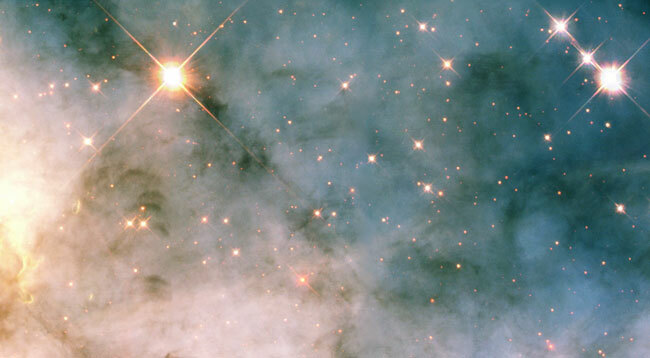 To help find out, astronomers pointed the Hubble Space Telescope to the regions surrounding Eta Carina, a star showing signs that it may explode sometime in the next million years. The nearby nebulosity, shown above, is home to streams of hot gas, pools of cool gas, knots of dark globules, and pillars of dense dusty interstellar matter likely forming young stars. The above image explores about three light-years, a region size intermediate to the Eta Carina cocoon, which spans only about one-half of a light year, and the Great Nebula in Carina, which spans over 300 light years. In April of 1843 Eta Car briefly became second only to Sirius as the brightest star in planet Earth's night sky, even though at a distance of about 7,500 light-years, it is about 800 times farther away.